Cash - What is Money in Accounting, Finance and Economics? In financeFinance OverviewFinance is defined as the providing of funding and management of money for individuals, businesses, and governments. The financial system includes the circulation of money, managing of investments, and lending of funds. and accountingAccountingOur Accounting guides and resources are designed as self-study guides to learn accounting and finance at your own pace. Browse hundreds of articles on important topics such as the income statement, balance sheet, cash flow statement, depreciation methods, how to link the 3 statements, debits & credits, journal entries, cash refers to money (currency) that is readily available for use. It may be kept in physical form, digital form, or invested in a short-term money marketMoney MarketThe money market is an organized exchange market where participants can lend and borrow short-term, high-quality debt securities with average maturities of one year or less. product. In economics, cash refers only to money that is in the physical form. Cash is the lifeblood of a business. For a company to cover its operating expensesExpensesAn expense is a type of expenditure that flows through the income statement and is deducted from revenue to arrive at net income. Expenses are considered it needs to have sufficient money on hand to pay its employees, contractors, vendors, and suppliers. Companies also need money to fund capital expendituresCapital ExpendituresCapital expenditures refer to funds that are used by a company for the purchase, improvement, or maintenance of long-term assets to improve the efficiency and invest in long term growth project. If companies don’t have enough cash on hand, they may finance their OpEx and CapEx by borrowing money (debt) or by issuing shares (equityEquityIn finance, equity is the market value of the assets owned by shareholders after all debts have been paid off. In accounting, equity refers to the book). The intrinsic valueIntrinsic ValueThe intrinsic value of a business (or any investment security) is the present value of all expected future cash flows, discounted at the appropriate discount rate. Unlike relative forms of valuation that look at comparable companies, intrinsic valuation looks only at the inherent value of a business on its own. of a business is generally considered to be the net present value (NPVNPV FormulaA guide to the NPV formula in Excel when performing financial analysis. It's important to understand exactly how the NPV formula works in Excel and the math behind it. NPV = F / [ (1 + r)^n ] where, PV = Present Value, F = Future payment (cash flow), r = Discount rate, n = the number of periods in the future) of all its future cash flowsCash FlowCash Flow (CF) is the increase or decrease in the amount of money a business, institution, or individual has. In finance, the term is used to describe the amount of cash (currency) that is generated or consumed in a given time period. There are many types of CF. After all, an investor purchases a company to make a return on investment (ROIROI Formula (Return on Investment)Return on investment (ROI formula) is a financial ratio used to calculate the benefit an investor will receive in relation to their investment cost. It is most commonly measured as net income divided by the original capital cost of the investment. The higher the ratio, the greater the benefit earned. ), and the return comes in the form of cash. 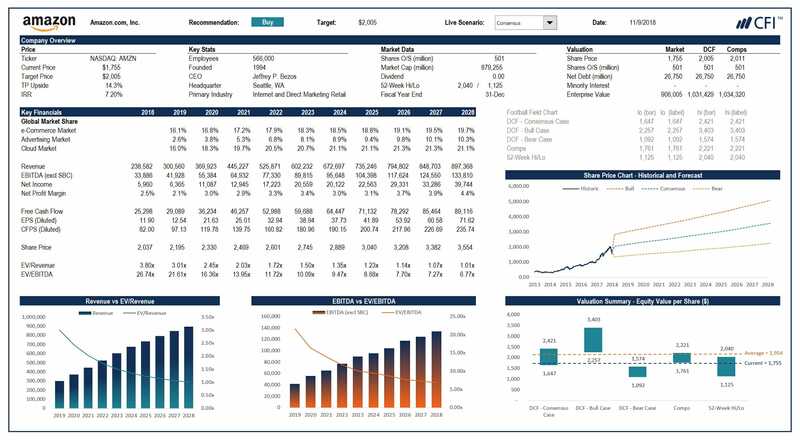 Learn more about financial modelingWhat is Financial ModelingFinancial modeling is performed in Excel to forecast a company's financial performance. Overview of what is financial modeling, how & why to build a model. A 3 statement model links income statement, balance sheet, and cash flow statement. More advanced types of financial models are built for valuation, plannnig, and and valuation in CFI’s financial analyst courses. Image: CFI’s Advanced Amazon Financial Modeling Course. 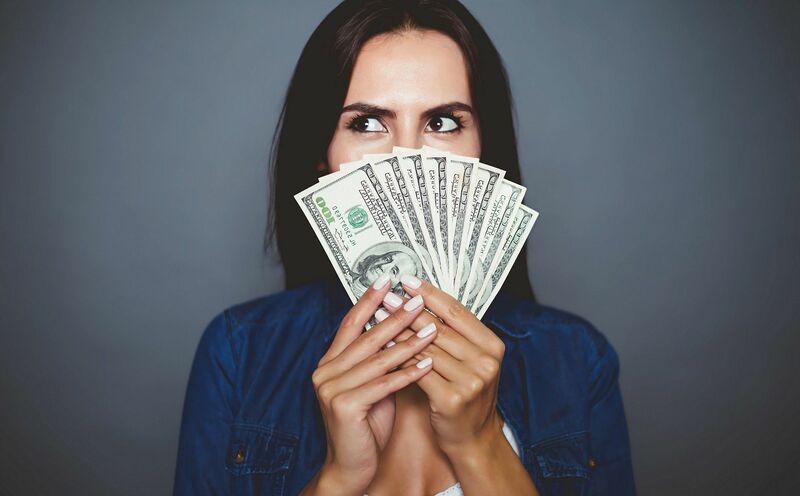 Cash plays an important role in the financial statementsThree Financial StatementsThe three financial statements are the income statement, the balance sheet, and the statement of cash flows. These three core statements are intricately linked to each other and this guide will explain how they all fit together. By following the steps below you'll be able to connect the three statements on your own. of a company. On the balance sheetBalance SheetThe balance sheet is one of the three fundamental financial statements. These statements are key to both financial modeling and accounting. The balance sheet displays the company’s total assets, and how these assets are financed, through either debt or equity. Assets = Liabilities + Equity, it appears as the first item at the top, since it’s a company’s most liquid asset. Companies often include “equivalents” in this category, which are money market funds and other short term investments that are easily convertible into cash. To reconcile the changes in cash over a period, accountants prepare a statement of cash flowsStatement of Cash FlowsThe Statement of Cash Flows is one of the 3 key financial statements that reports the cash generated and spent during a specific time period, it acts as a bridge between the income statement and balance sheet, which shows all money that was generated and consumed by a business, ending with the net change in money at the bottom. 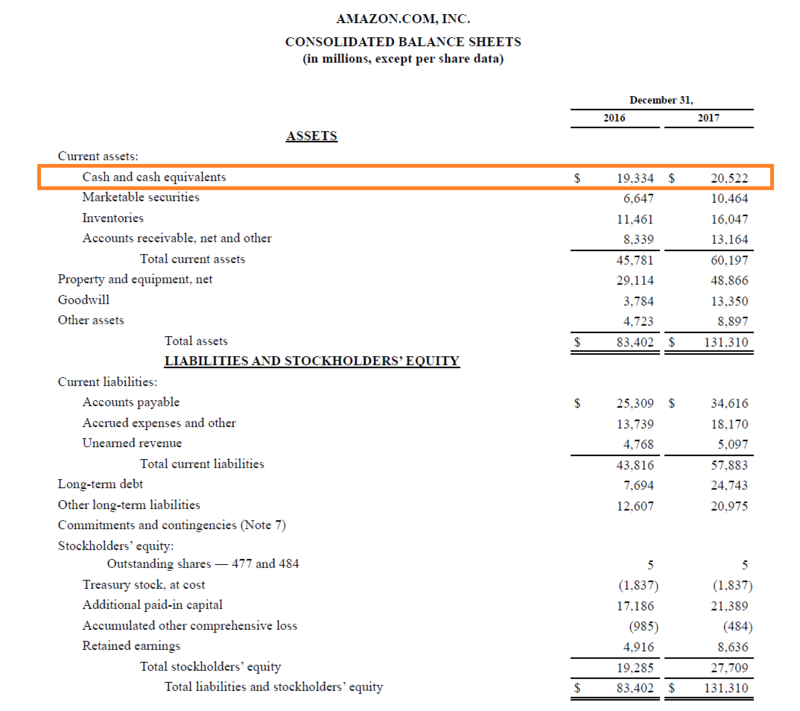 Below is an example of Amazon’s 2017 balance sheet, where can see the amount recorded on the very fist line of the statement. In economics, cash refers to money in the physical form, which includes all types of legal tender such as bills and coins. 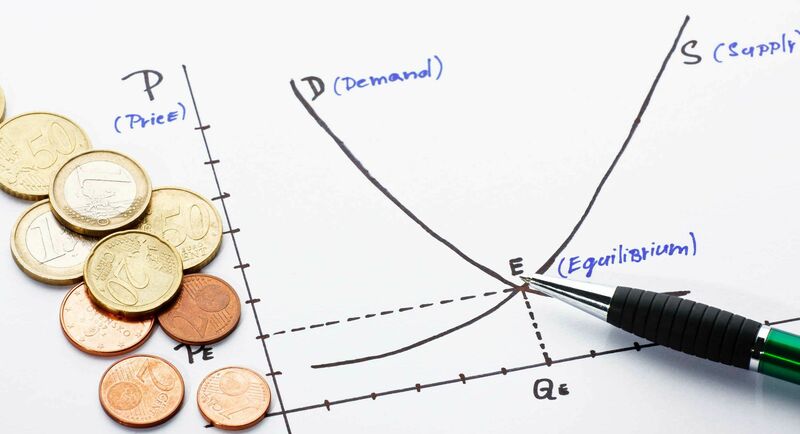 It is used as a reserve for making payments and is an important part of macroeconomic policies, including the money supplyQuantity Theory of MoneyThe Quantity Theory of Money refers to the idea that the quantity of money available (the money supply) grows at the same rate as price levels do in the lon.